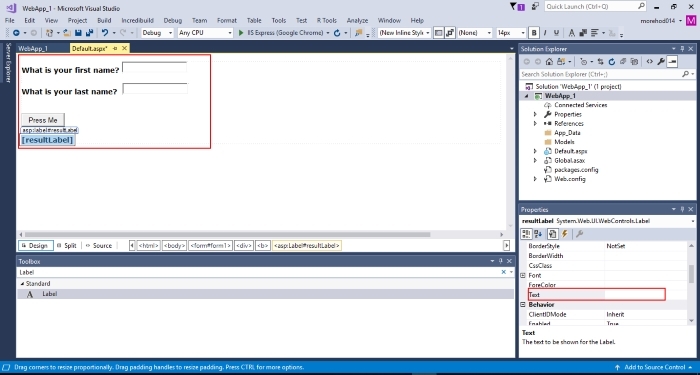 Once Visual Studio is successfully installed, launch it in order to build your first ASP.NET web application using C#. 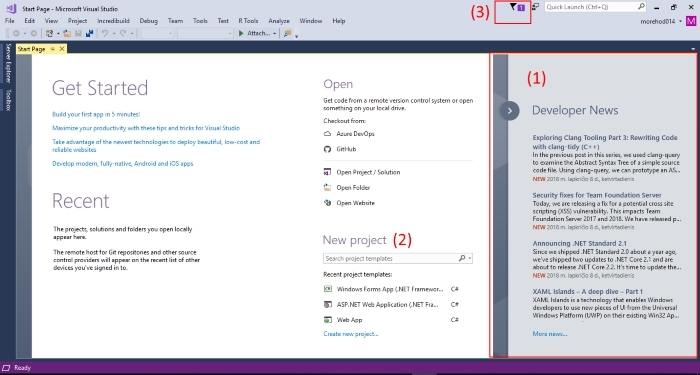 You will see the New Project window. 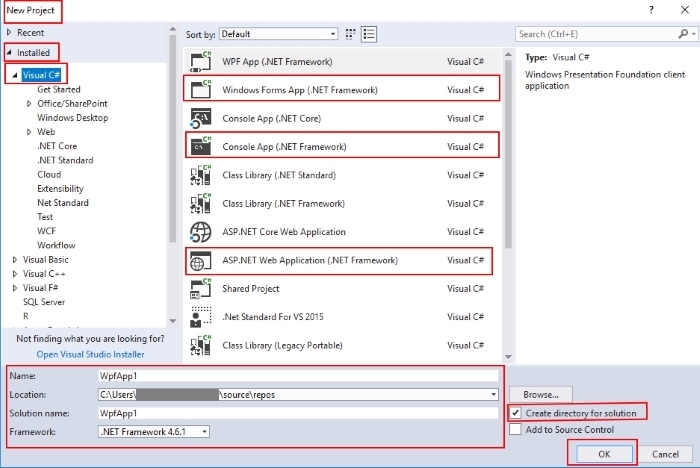 Go to the Installed Templates-> Visual C# -> You can select any template (Windows Form App or Console App or ASP.NET Web Application). 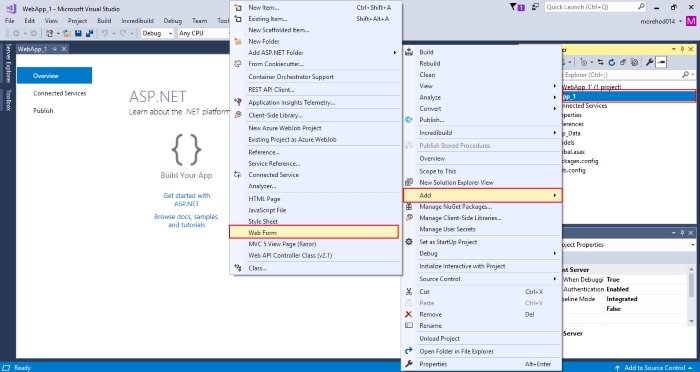 We need to select the ASP.NET Web Application, framework version (for example 4.7.2), change the name of your project to WebApp_1 and click on OK button. You will see another window. 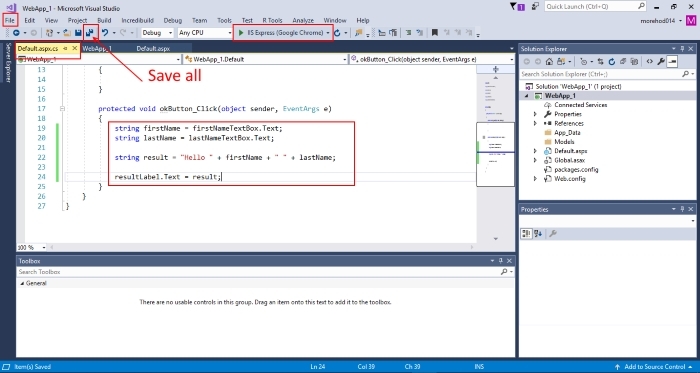 There are several different types of ASP.NET applications, however we will focus on Web Forms. 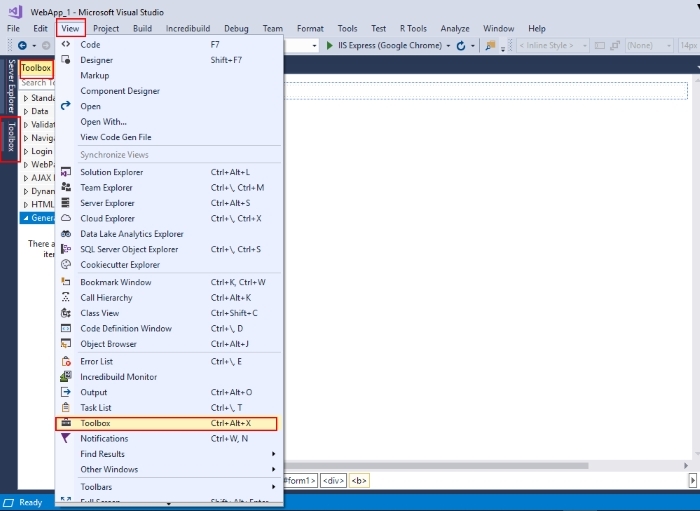 Select Empty in order to start from an empty template that lets us add a Web Form later. 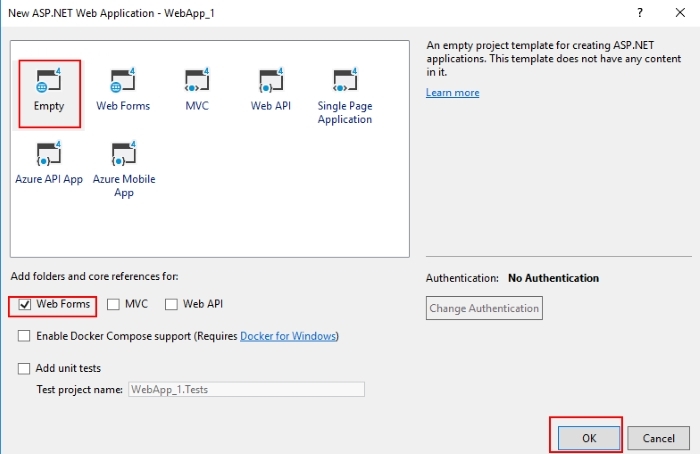 You will also want to select the option to Add folders and core references for: Web Forms and make sure that the Host in the Cloud option is deselected if available. Click on OK button. You will be prompted to specify a name. Call it Default and then click on OK button. This will create a page titled Default.aspx (the .aspx file name indicates that it’s a Web Form). 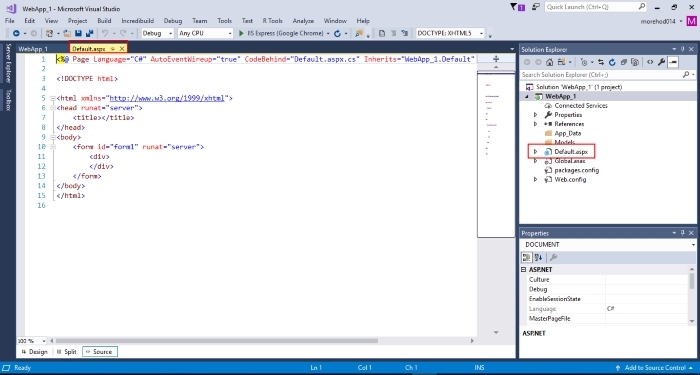 Once this launches, you will see some HTML mixed with ASP.NET declaratives. Ignore the background HTML/ASP markup for the Default.aspx file for now as you will be mainly working within the Design mode (or, the Designer). This provides a rough approximation of what your web page will look like once it’s running on the client's web browser. The Designer is a convenient WYSIWYG visual editor that allows you to add markup to your page without having to access the HTML/CSS code behind it. Enter the Designer view by selecting the Design button. You should see a dashed box at the very top with the body/div tag above it. Inside of the dashed box near the body tag, type the question - What is your first name? with two spaces following the question mark so that we can insert a Control item later. 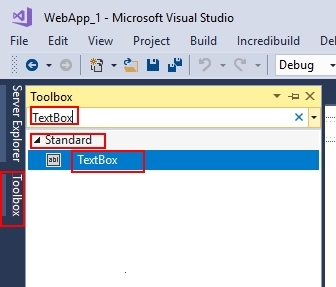 Go to Toolbox and find a Server Control called TextBox. If the Toolbox is not visible for you, you can make it visible by going to View -> Toolbox. In the upper right hand corner of the Toolbox, you will notice a little pin that allows you to enable or disable auto-hide for that window. 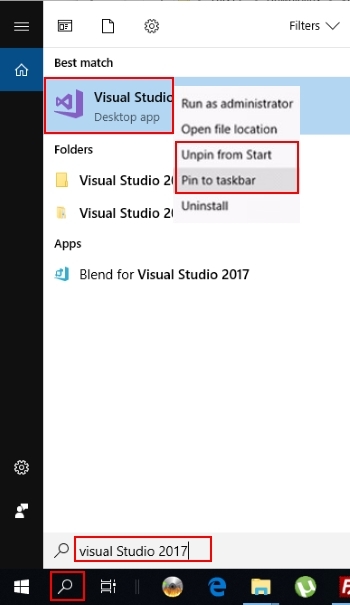 Pinning and unpinning is very useful, especially if you find yourself accessing a menu item frequently. Pinning this menu will come in handy for now. Double-click the TextBox option in order to insert it into the web page where your cursor was last at (the two spaces after the question). Now, making sure that your cursor is positioned after this TextBox, press the enter key twice on the keyboard and type What is your last name? followed again by two spaces. Now, repeat the previous step to insert another TextBox control after this phrase. Once again position your cursor at the end of the last line and press the Enter key two more times. Returning to the Toolbox you will find, near the top, an option that inserts a button inside of your web page. After the button is inserted, once again press Enter key twice and back in the Toolbox find and insert a Label Control. 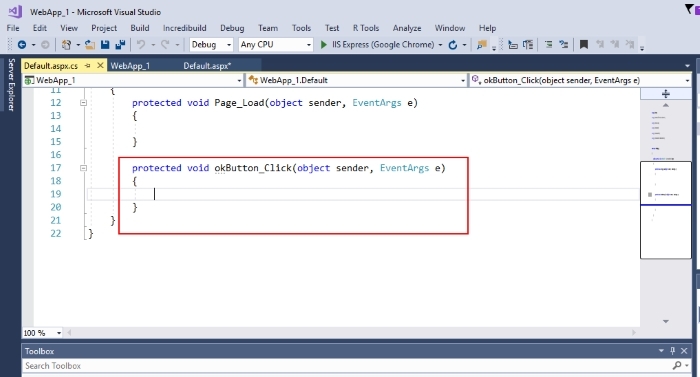 The next thing to do is set some properties for these Controls (which are actually called ASP.NET Server Controls). 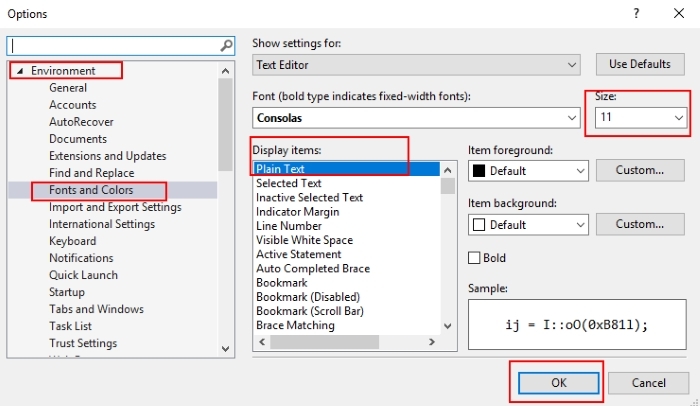 Select the first TextBox and when it's selected go to its Properties in the right-hand pane. 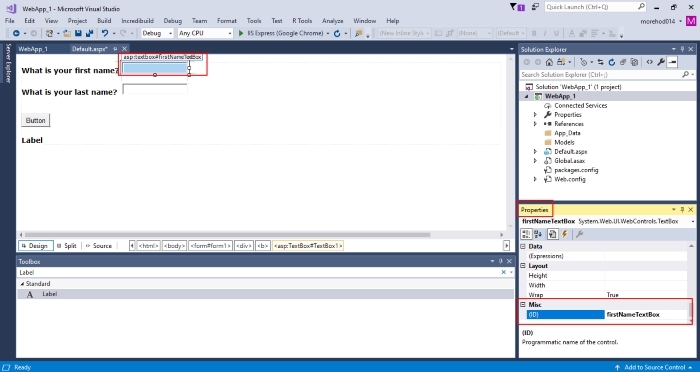 If you don’t see the Properties pane go to the menu and select View -> Properties Window. 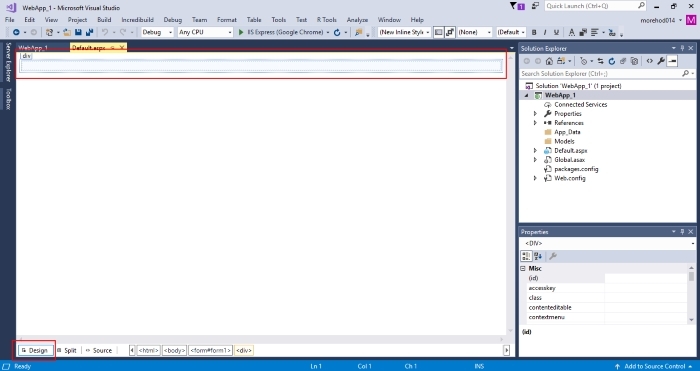 You can just press the F4 key to display the Properties window. 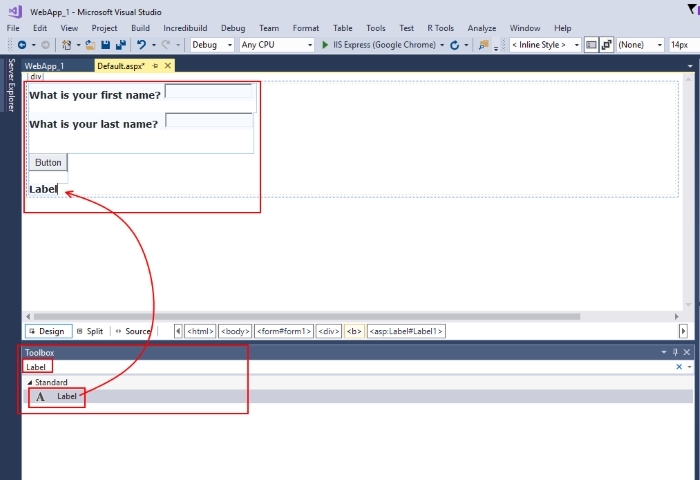 In this window, change the programmatic ID for the first TextBox to firstNameTextBox. This name will let us keep track of what was entered in the TextBox, so we can later reference it within code. 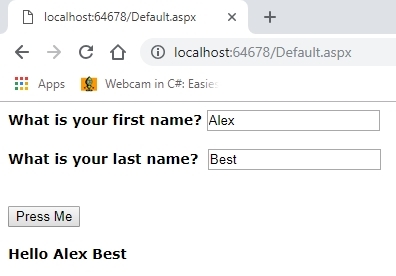 Select the second TextBox and set its ID with lastNameTextBox. Select the Button Control in the Designer then go to its Properties window and change its ID to okButton and also change its Text label (under Appearance) to Press Me. Select the Label control in the Designer and change its programmatic ID to resultLabel, while also removing the value in the Text field. Removing the text for the Label ensures that nothing is shown by default (this will instead be determined in code later). The part that says [resultLabel] will only be visible in the Design view, but will not be visible within the public-facing web page. 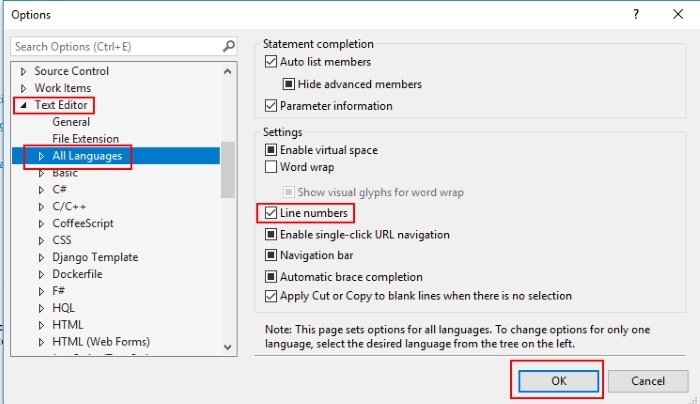 If you see red squiggly underlines – it’s an indicator that you omitted, or mistyped, something in your code. Save all of your work. 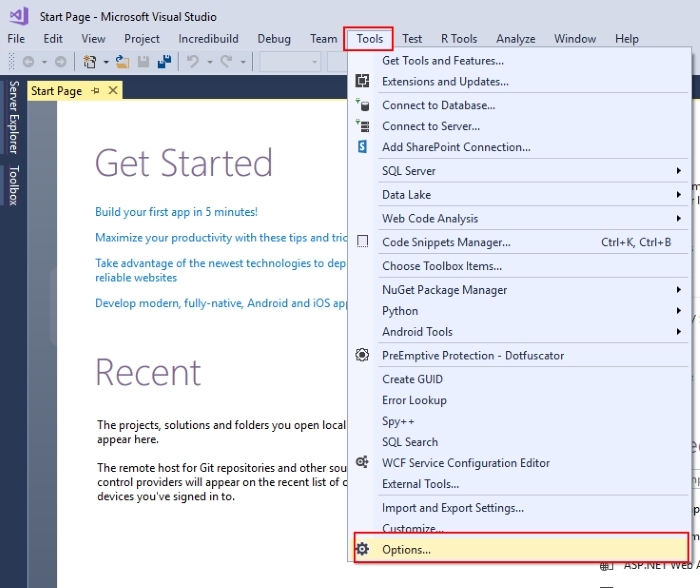 Click on the Save All icon in the Visual Studio menu or from the menu select File -> Save All. Let’s get the result of all of our work by running the application. 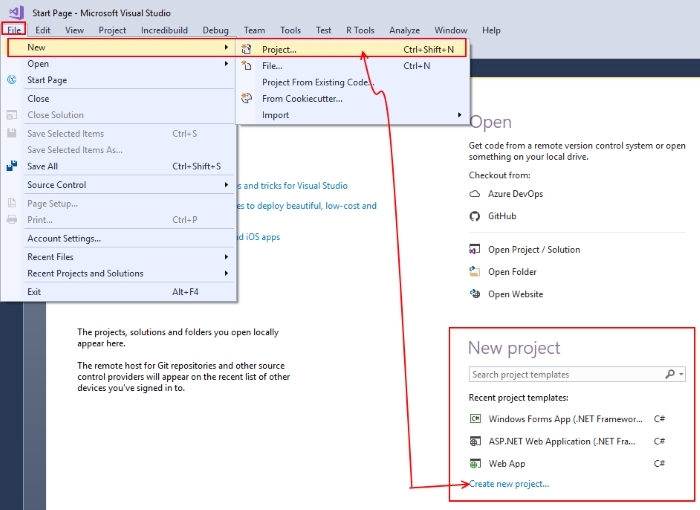 Click on the green arrow icon in the Visual Studio menu to run the application in your web browser of choice. You can now test out the application in the browser by entering your information in the form and see the result printed back to you after clicking on Press Me button.